Quality Bailiffs are pleased to announce we have achieved CHAS accreditation. There is a lot more to being an Enforcement Bailiff than you might think. Our job includes considering risks to staff, evictees and property. With this in mind, we have taken a further step to formalise our already high standards of risk assessment and health and safety. A bit about who and what CHAS is. What we had to do to achieve the accreditation. How gaining this accreditation is good for us as a company and you as a client. Standardising health and safety requirements. By doing this they also made the health and safety contractor assessment easier to understand. A comprehensive health and safety assessment that would cover the company rather than completing a fresh assessment for each job. We registered with CHAS online. We completed the application form and supplied appropriate documentation as required. The CHAS assessment team reviewed our application. This included examples of job method statements, risk assessments and references. We also included examples of cases we have successfully completed and the challenges we faced. We were approved and the assessor sent a PDF copy of our certificate and approval letter within 10 ten days of submitting the application. You will know that all of the Enforcement Agents working for Quality Bailiffs will be working to a competent level in all risk assessment and health and safety aspects of your case. You will have a provable record that due diligence has been carried out when choosing our company to complete your enforcement cases. CHAS has already done this for you. As your work is carried out by competent Enforcement Agents, your reputation will be protected. We are already approved to work with over 900 clients, ranging from County Councils to Cancer Research. We are confident that our health and safety records are kept in one place and meet all the legal requirements necessary to carry out effective enforcement bailiff duties. Our clients can engage our services with confidence that we are working to the highest standards. I would like to take this opportunity to thank all of our staff that have made the achievement of this accreditation possible. 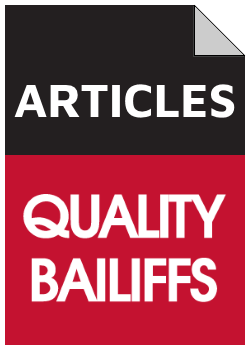 Quality Bailiffs has over twenty five years of experience in the bailiff industry.